"Acronym" redirects here. For abbreviations and jargons used by the community, see MouseHunt Jargon. The Arcane Capturing Rod Of Never Yielding Mystery (or A.C.R.O.N.Y.M.) is an Arcane type weapon. This highly unstable trap setup is held in a constant state of metamorphosis by the unpredictable power of the Onyx stone. This trap almost appears alive, growing metal roots into whatever base to which it is attached. This trap's methods of capture are infinitely random. It can use its jagged metallic roots to impale mice, expel a thick and dark vapor that turns mice into stone, or bend space and time to erase the mouse from existence. Scientists of Digby warn hunters that the power of the Onyx stone is incredibly dangerous and fear that using this trap could lead to the end of the world. The Arcane Capturing Rod Of Never Yielding Mystery is not sold by any Trapsmith. It can only be crafted given the proper ingredients. The ACRONYM (if unintentionally smashed) can be reassembled from A.C.R.O.N.Y.M. Parts. Obelisk of Slumber – Source of Obelisk Parts. Obelisk of Incineration – Source of Obelisk Parts. Grand Arcanum Trap – Requires A.C.R.O.N.Y.M. Parts to craft. A complete list of Arcane weapons can be found here. Smashing this weapon with the Hunter's Hammer yields A.C.R.O.N.Y.M. Parts. 19 February 2009: The Arcane Capturing Rod Of Never Yielding Mystery was introduced with the release of new items at the Catacombs General Store, finally revealing a use for Onyx Stones. The Arcane Capturing Rod Of Never Yielding Mystery was the first weapon to yield higher power when paired with the Stone Base instead of the Explosive Base. The Arcane Capturing Rod Of Never Yielding Mystery trap's name is a play on words, since it is frequently referred to via an acronym of its first letters that spell "acronym". 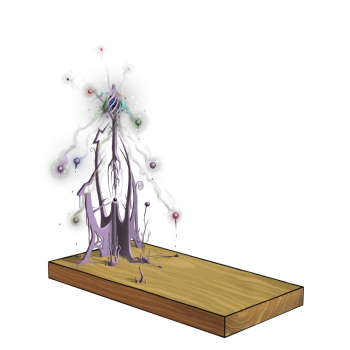 14 November 2012: The Arcane Capturing Rod Of Never Yielding Mystery became smashable, along with the introduction of the reconstruction recipe, with the introduction of the Living Garden and the Grand Arcanum Trap. This page was last edited on 27 January 2019, at 01:10.